The last few months of the season saw Taylor Phinney riding the Worlds, Fabian Cancellara taking on the Vuelta (well, most of it) and the Worlds, and Joaquim Rodriguez riding the Vuelta, the Worlds and Il Lombardia – all with some interesting results. Won individual time trial, second in team time trial, one second place at Vuelta a Espana. 3rd in Road World Championships individual time trial. 10th in Road World Championships road race. The last part of the season was all about prepping for the World Championships for Fabian Cancellara. He used his time-trialling skills to put RadioShack-Leopard in second place on the Vuelta’s opening team time trial. As his training was for the road race rainbow jersey, he was active in the first week’s stages, very much at the sharp end of the finishes, including placing second in stage four. He was also a punishing presence on the front of the peloton in the mountains, shelling out lesser riders in the team’s quest to keep eventual winner Chris Horner in good position. He went on to win the individual time trial on stage 11, vanquishing Tony Martin by 37 seconds. Fabs then abandoned the Vuelta after stage 17 in order to fine-tune his form for the Worlds. Fabs had a predicament – give everything in the Worlds individual time trial in pursuit of a fifth title or hold a little back to stay fresh for the road race. In the end, it looked as if he gave it all, but came in two seconds behind Bradley Wiggins. They were both well and truly spanked by Tony Martin, who took his third title by a margin of 46 seconds. It was then a cold and rainy road race – one that saw Spartacus riding in the strong lead group of the peloton but by the final few kilometres when the jump was made by Joaquim Rodriguez, Cancellara had nothing left to give and crossed the line in tenth place. Cancellara’s 2013 season, however, was one of his best, with his dominance in the classics including winning the Flanders/Roubaix double in fine style. 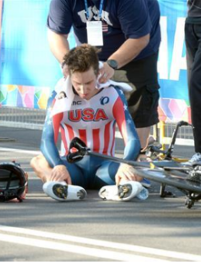 Although he has had to pay the price in all-important seconds to try to achieve his goals in road racing, he is still one of the sport’s premiere time-trialists. He finished the season a very respectable seventh place in the WorldTour rankings. No doubt with the Trek team being built around him next year, he will continue to be a formidable opponent in whatever races he targets. WorldTour ranking: 96th, 38 pts. Taylor Phinney has had a rather quiet year of it and there’s little to report from the last few months of the season. He was targetting the time trial in the World Championships but unfortunately he didn’t have it on the day or on a course that was just that bit too long for his riding style. He did, however, continue to light up Twitter with his effervescent personality, so he was always getting some time in the spotlight. My hope for That Boy Phinney next year is that his results match his perseverance in races and we start consistently seeing him on the podium throughout the season. Let’s see where his prodigious talent can take him! 4th overall at Vuelta a Espana, won one stage, two third places. 1st overall in individual WorldTour rankings. WorldTour ranking: 1st, 607 pts. 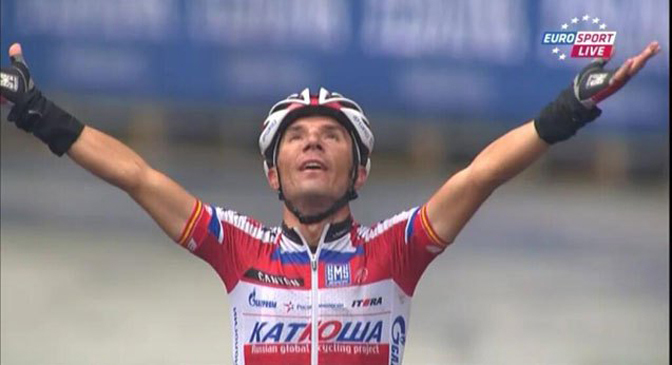 It was a bittersweet end to Joaquim Rodriguez’s 2013 season. He finished fourth in a gruelling Vuelta a Espana – a race that looked more suited to him than the Tour de France but his legs might still have been recovering from his podium finish in that grand tour. He did win a magnificent mountain stage, doing what Purito does best and looking like he’d been fired out of a cannon to leave his opponents behind. The following Sunday, we saw the Rodriguez we know and love again as he took off like a rocket for the finish of Il Lombardia, winning the race for the second year in a row and putting him at the top of the WorldTour rankings, again, for the second year running. By anyone’s measure, Rodriguez had a sterling season. He was second at Liege-Bastogne-Liege and sixth at Fleche-Wallonne for a great Ardennes campaign. He skipped the Giro to concentrate on the Tour de France, where he took third overall. Then he rode a great Vuelta, a great (if heartbreaking) Worlds and finished off his season in style and at number one with his Lombardia win. My hope for his 2014 season? That he finally graces the top step of a grand tour. I think you have TP’s results reversed. He was 5th in individual and 4th in team time trial I believe. Phinney is at a point where he needs to start to deliver to prove that he’s not just “a talent” and is capable of becoming the star that he should be on paper. Perhaps it was just BMC’s 2013 problems that made him look a bit average but it’s got to be a concern for him and his team.